Leroy has come down with a moderate case of dry, flaky skin. It’s not that surprising to me because this is the time of the year when he is exposed to dry air and the fact that he is no longer eating a fish based diet anymore isn’t helping. Normally in this type of situation I would add some fish oil to his food and be done with it. However, we are suppose to be staying away from all things fish with him, and since we are making progress with his ear infection, I don’t want to take the risk of throwing that progress off. So what’s a girl to do with a dog that has dry skin, but needs to stay away from fish that is packed with Omega’s? Well I had remembered reading a few articles on coconut oil a couple of months ago. The 2 articles that stood out to me were The Bombshell About Salmon For Dogs And Other Healthy Alternatives, from Kimberly at Keep the Tail Wagging and Everybody Is Asking About Coconut Oil, from Jana at Dawg Business. A few weeks ago I returned to those articles and asked around to see if anyone else was using coconut oil for their dogs. I was amazed at how many people are and have seen great results. So thus, as of 3 weeks ago, we have begun the coconut oil experiment. Coconut oil contains Lauric acid, which is a medium chain fatty acid that is also found in mother’s milk and is said to prevent viral, bacterial and protozoan infections. Capric and caprylic acid which are also found in coconut oil, have similar properties and are best known for their anti-fungal effects. 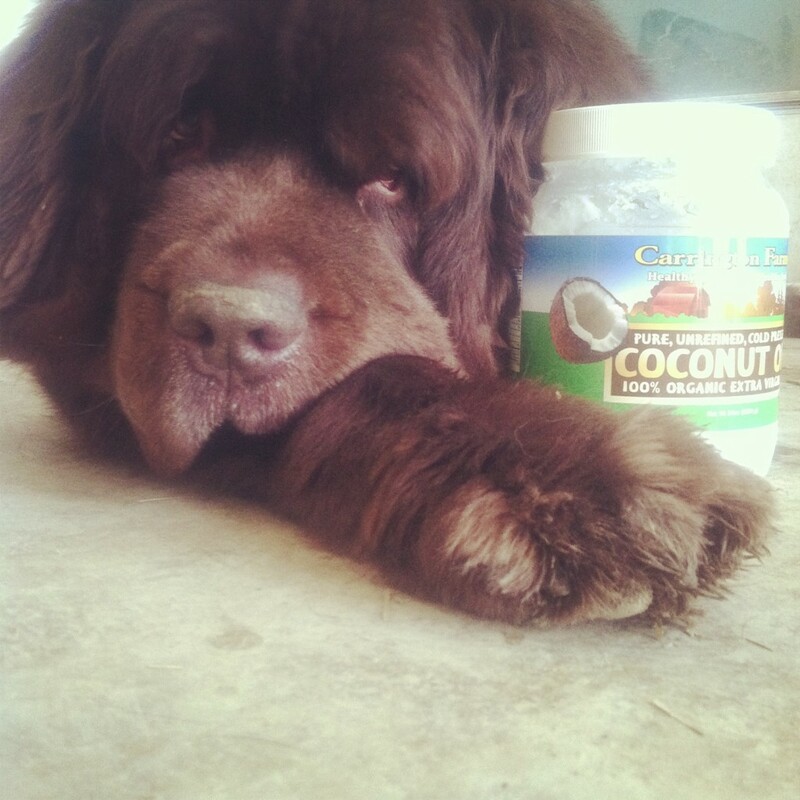 The best part is that most dogs are said to love the taste of coconut oil! I am having really good luck with adding coconut oil to the dogs diet and here are some things I found along the way that might help those who are interested in trying this out for their dog. It was recommended to me to get Pure, Extra Virgin, Unrefined, Organic Coconut oil. The best to place to buy coconut oil is from a wholesale retailer. My grocery store was selling an 8oz bottle for $10.99. I found a 54oz jar of it at Costco for $15.99. The recommended feeding dose of coconut oil is 1/4 teaspoon per ten pounds according to Dr. Karen Becker. You start off slow and gradually increase. Coconut oil is said to detoxify the body and dogs may show flu-like system if too much is given too soon. I scoop it onto treats and give it to the dogs that way. Leroy absolutely loved the coconut oil from the start and goes to the counter looking for it, which has lead me to place it securely behind locked cupboards. Sherman wasn’t a fan at first and I think it was a texture thing for him, but he has gotten over it. Coconut oil looks like Crisco. I was expecting it to be an oil. Don’t laugh. I was seriously expecting a liquid not a solid. I must of missed that chapter in science class. Coconut oil that gets on your hands after you give it to your dogs can be wiped on YOUR dry, scaly legs! Oh yeah! Don’t wipe that off on a towel. Reap the benefits for yourself. 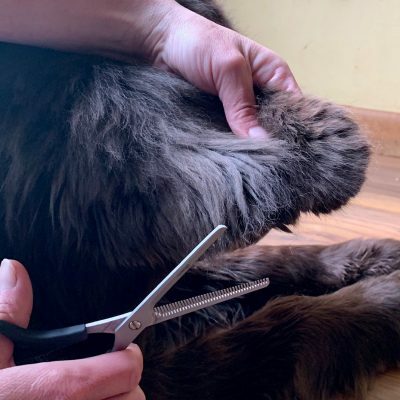 Overall, I’ve been really impressed with the results we have seen and while Leroy’s still has flaky skin, it has greatly improved over the past few weeks. I asked my vet about using the coconut oil and she wasn’t all that familiar with it, but she did some quick research and told me to give it a try and report back to her. I asked Sherman’s holistic vet and he told me to go for it. So how about you? 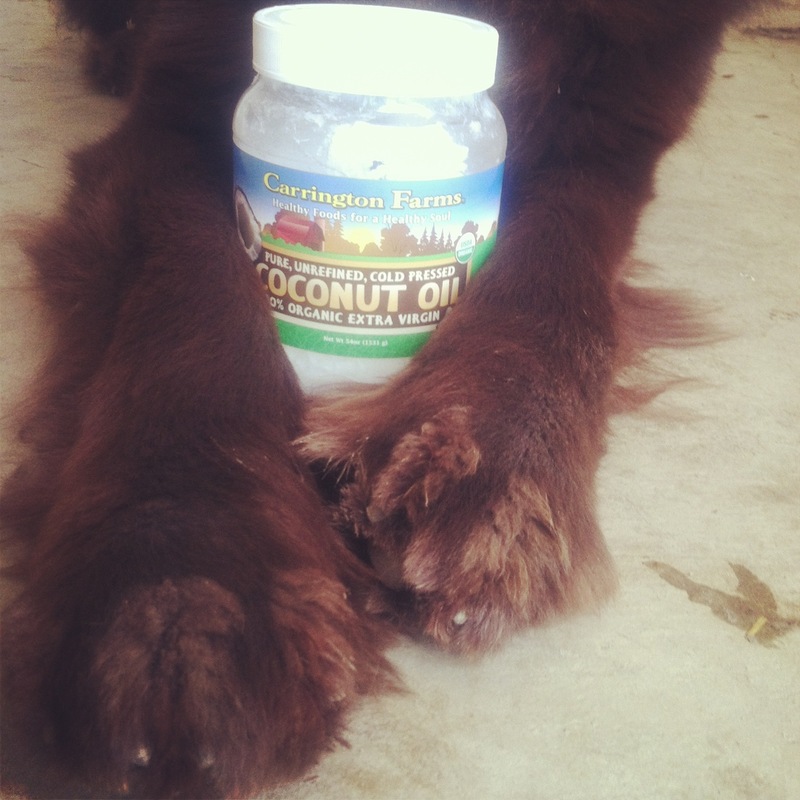 Have tried coconut oil for your dogs? For yourself? Any success stories you would like to share? **Please remember to always consult with your totally awesome veterinarian before adding anything new to your pets diet. This post is sharing my experience with giving my dogs coconut oil and is not meant to replace any recommendations or advice from your vet. « Wordless Wednesday. Is There Something Hanging From My Mouth? In India we use coconut oil on our hair, body and even cook in it. It’s a multipurpose oil. The girlz LOVE it and I love the results! Chloe used to have really dry skin and it has been a tremendous help! Hope it helps Leroy and Sherman! If your pets will not eat it, dog or cat… mix it with some canned PUMPKIN or Plain Yogurt both of these are great for your pets too! If your dog has IBS or any digestive problems.. COOCNUT OIL is awesome for it. If you want to change the texture of coconut from the crisco-like solid to a liquid oil just put some in the microwave on low (be careful not to overheat) and simply melt it then drizzle it over their dry food or whatever you like. My 4 Newfies love it. I did add some into Jasmine’s food, as well as I used in for her paws. The most impressive results I got when I tried it on my own hand, where I had skin cracked from cold and it was not healing. Twice I used coconut oil on it and each time it healed within two days, while it was there for weeks until then. 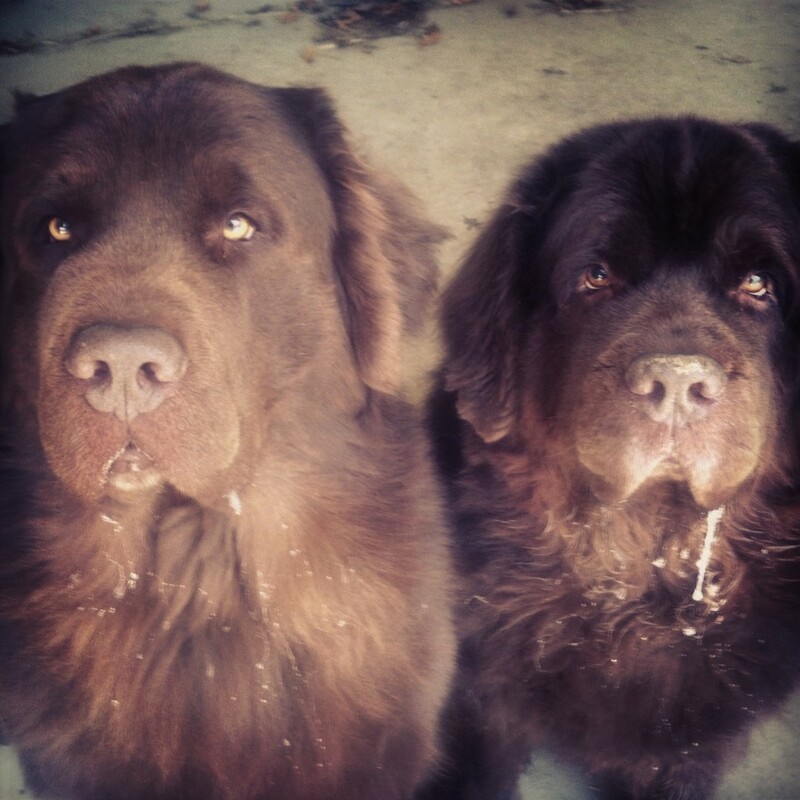 Our Auntie was eating coconut oil….we think she’s off it. (Her diet fads seem to peter out quickly). Maybe it’ll help. We certainly hope so. Have never used it, so really interested in your experiment. Thanks for sharing and hoping you’ll do another update in a few weeks. Our local dog trainer/radio show host has been recommending it for years now. I have been meaning to try it out, but now you’ve got me motivated. Just so you know, I thought it was an oil too! Very interesting. Have you noticed whether it has any benefits for aiding digestion? I am thinking this may be something to help Thunder with his digestion issues after his bloat surgery. Also, have you heard whether dogs can be allergic to it? As far as being allergic to it, my guess would be that there is that potential, but I didn’t find anything when I was researching it. Digby loves the taste! We have been trying it for ourselves- replacing veg oil and even olive oil. Wellactin is very expensive- his vet had him on it for his skin issues. I saw your info on Leroy and tried it the other day- I may stick to it! Glad it is working…but I was expecting to see doggy pina coladas on the list 🙂 Mom is the only one with dry skin in the house and she uses coconut oil based lotion, but we are hearing a lot about dogs using coconut oil, so it must be good. I haven’t tried it, but you make me really consider it! I had no idea! Me and the dogs have been on coconut oil for the past year. All the health benefits you listed, are for people too. I cook with it, bake with it, replace half the butter in cookies. I mix it up with a little greek yogurt and fresh fruit, we all love it like that. And I want to know why my costco is $21 and not $15. Different brand I guess. Hmmmm. I’m pretty sure I paid $15 for it and I threw my receipt away, but when I go to buy some more I will keep the receipt! I have read about all the benefits, but hadn’t tried until very recently. I have been adding it to my smoothies. The boys get a little bit of smoothie everyday as well, so get a bit of the oil. One thing to keep in mind is it is very high calorie, so to avoid weight creep, reduce food someplace else. And finally, where do you live?! That same exact 54oz jar at my Costco is 24.99! I’m gonna shop near you! Lol. We are in Ohio. Now I’ second guessing if that was the price but I’m pretty sure it was. Coconut oil has actually been linked with weight loss. Apparently not all fats behave in the same way. Some studies have suggested that small amounts of other pure fats can cause weight gain and yet coconut oil given in the same amount or much more, caused weight loss. I’m not sure if it’s fully understood why this is. Even though there is some saturated fat in coconut oil, it doesn’t appear to cause any detrimental effect. To the contrary, benefits are reported all over in animals and humans! Hello just LOVE your blog! … just responding to Lea to let her know that saturated fat does not cause fat (or heart disease for that matter) .. it ‘s the carbs that do. Coconut oil is a MCT or medium chain triglyceride so it is one of the healthiest fats going. But wanted to point out there is NO omega3 in coconut oil so you need to make sure your dog is getting a source of DHA in their food — small fish like sardines (packed in spring water or krill oil are the safest sources for this. I tried using it on my body once in place of lotion, but it left me too greasy, although if you rubbed it in and then used a towel that might be okay. BTW you do know it becomes liquid at 70 degrees? I use it in cooking, it’s great for baking, gives your goodies a coconut taste, try using it in chocolate chip cookies. 😉 AND the way to melt it, is to put it in a glass and put the glass in hot water, microwaving it kills many of the good benefits. For stir fry I just throw it in the pan. I bought a jar of this at WalMart for about $6.00 and have been using it to moisturize my dog’s foot-pads since they were dry and cracked from winter ice and salt on the sidewalks. She licks off the excess oil so it benefits her inside and out! I also use it to moisturize my hair/scalp (same jar!) and it works great! My hair is so soft and my dry scalp has disappeared. Very interesting. Mom says she may have to check it out.Too bad it doesn’t come in capsules. Coconut oil does come in capsules. Check health food stores. Purchased mine at Vitamin World. Bit expensive but I travel and it is soooo convenient. I too read a lot about coconut oil, I bought a big jar for Brooks (but sadly didn’t get to try it out.) I was going to rub it on his dry, itchy skin but wondered if it would make his fur a mess if applied topically? Have you tried rubbing it into their coats yet? We have been hearing great things too, but just started using it for no particular skin problem. Sounds worth a try – unless it smells like suntan oil…does it? To me it has a very light coconut oil smell-but not as strong as suntan oil. It’s my go-to oil for cooking. Plus because of it’s grime-fighting and antibacterial properties I use it like toothpaste for Suki. I used to use an all-natural toothpaste for her but stopped when I found out about carageenan, and I just found the toothpaste carried at the vet office didn’t work very well. The coconut oil has actually reduced a lot of the plaque on her teeth that had been there since she was three, whereas the actual toothpastes just sort of controlled any further plaque build-up. I’ve had so much success with it I’m contemplating ditching my own toothpaste for coconut oil now haha. It’s a solid unless you happen to live in Arizona. During the warmer (ok, scorchingly hot) months here, it’s just like regular oil. I use it myself when cooking – it’s much healthier. I don’t buy it in bulk though. I wait until it is on sale then I load up my cart! Yes, unrefined, organic, virgin coconut oil is best! I gave a teaspoon to Blueberry in her food. She was not pleased. I will try again though – or else just add it to the baked treats I sometimes make her. Not that she has dry skin or anything – but it’s so beneficial in other ways! Glad your boys like it! I am going to have to give this a shot! With all those benefits, this hits all 4 of my dogs in one way or another… now to figure out what dosage to start each at, ha ha! Wow, I wish I’d known about that when my Golden Retriever was alive. He had more skin aliments than any pet I’ve ever had. Continued good luck with your experiment! And thanks for sharing!! Haven’t tried it for the dog. She sure loves EVOO, so I bet she’ll love this too! Good to know taht you can substitute it for butter in cookies! Oh, and I just bought the huge jar at Costco yesterday and it was $21.49 here. But I’m used to things always being more expensive here in So Cal! I use fish oil for Riley’s nails that break…I wonder if coconut oil would help…I’ll have to research it! Thanks for the idea. PS–totally pictured you with a giant head when you talked about your massive brain! Haha! It seems there are a lot of benefits to feeding the dogs coconut oil – I may have to start it for my boys! That being said, the Virbac ResiSOOTHE lotion is an absolute miracle. Buster was flakey and itchy when the seasons started to change and this lotion made all the difference. One application lasts for weeks and all the flakey skin and itchiness disappears. Really, you must try it. Such a treasure in a jar! I am glad is working for your guys, Jen. For those pups that like the flavor but are not delighted with the Crisco-ike texture, I found you can take advantage of all the benefits of the coconut oil you very well listed above by using it in other forms like coconut milk and roasted coconut flakes. We use these forms in our natural, gourmet and organic Dogfroyo treats by YAPPY TREATS CART. Used topically or ingested, when it penetrates the body, the fatty acid (lauric acid) in the coconut milk has powerful antiviral and antibacterial properties that can be used to fight infections and viruses. Coconut milk contains selenium, which is an antioxidant that relieves arthritis symptoms. Selenium controls free radicals and decreases the risk of joint inflammation. For users concerned about saturated fat level contents in coconut oil, in moderation it can help control weight. Because of its fiber content, it makes the body feel fuller longer. A source in manganese, it has a calming effect and helps to maintain normal blood pressure. It aids regulating blood sugar levels, improving metabolism function, and maintaining a healthy digestive track. Topically, you can also use its cream form to treat sunburns, reduce wrinkles, and as an eye make-up remover. I had started it for the girls. But I found it to be a pain to try and scoop out in their food. Daisy is fine but Bella won’t eat it unless its melted-so hot water in her bowl, then add food. I know it is also recommended for humans to help prevent dementia. Maybe I should eat it too! Good to know! My health food friends LOVE coconut oil for themselves and their families. I know that our local Bountiful Baskets will sometimes offer it. http://www.bountifulbaskets.org/ Imm hafta look into it for us. Thanks! This stuff is not just for dogs depending on your weight 3tbs a day will help you get to your proper weight and other older age problems it is the best oil to cook with! It is a good fat that you can eat and help you to lose weightand keep the weight off. Not an over powering taste or flavor either that or like you might think. Good for animals and humans and it will help bnoost your metabolism and or energy over time. Good for almost All internal organs heart, liver, kidney’s, pancreas digesti9ve track etc. It used to be used in the US until the introduction of margerine and poly unsaturated fats. My female Border Collie Summer like it so it is an experiment with me as well! I also have used coconut oil and Tumeric in cat food for inflamation old age hip problems and for shrinking tumors and or growths! I was quite amazed about the Tumeric simple easy sprinkle it in the cat food mix it up and wallah she licks the bowl clean. Coconut oil is common here. The indians use a lot on their hair and body. I did try to consume a teaspoon of coconut oil everyday some time ago but then I got lazy and totally forgot about it. May be I should take it back for myself again. I would second the caution about the calorie content and potential weight gain. 3 T is almost 400 calories – about the same as 1 cup of the average kibble. I would love to try this for Maverick’s flaky skin but since we’re currently trying to get weight off of him I’m afraid it might sabotage those efforts. Some extra exercise could offset that though. 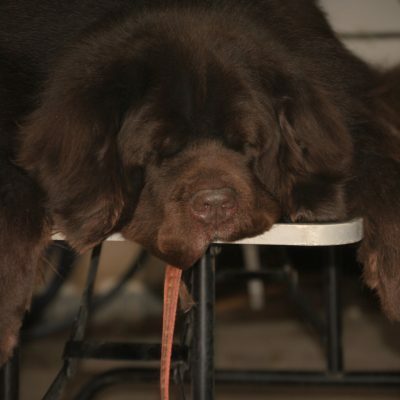 But definitely keep an eye on their weight as it’s no fun having a Newf on a diet…I know! Who knew it was so good! Glad Leroy’s skin is improving! My mom has been experimenting with coconut oil with one of her German shepherds for about a month now for itchy skin, red paws, general allergies that no one can seem to pinpoint, and has been having good luck with it as well. I am so trying this! Ha I thought it was liquid too! You got Mum to go to Costco at the weekend as she’d previously been getting her Coconut Oil from Trader Joe’s. She got a 78oz tub for $21.49, it’s not the same brand as yours, but still virgin and organic and I guess it’s more expensive as it’s larger. Thank you for such great info. Over the.ast year I have started substituting coconut oil for various products: cooking oil, eye creams, lotions, etc. and have never felt better. I even started blogging about it as well. My toy poodle Oliver definitely suffers from itchy skin, so I’m hoping this will help. Will start him out with a 1/4 teaspoon and eventually up to a half. 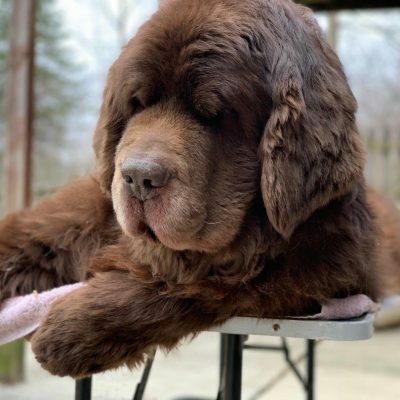 Your Newfies are beautiful!! Use head and shoulders. Worked really well for our newfy who had the same dry, itchy skin. Found a few forum posts by vets giving the approval and trialled it out a few months ago. Have been using it since and Obelix is much happier. I have been using extra virgin coconut oil for almost a year now with Minda, my chihuahua. She LOVES the taste and its awsome on her coat as well; makes her smell like a mounds candy bar!! Minda had puppies and their vet said it was ok to use coconut oil on their coat. Turned out, along with all the heath benefits, the aroma entertained the puppies enough to give me a break. (Those of you who have had to entertain a littler of puppies for weeks know what I mean) I just took all 5 puppies to the vet today for their first round of shots. (Chihuahua puppies at 8 weeks are old enough for certain flea treatments, but they dont weigh enough at that age for the treatments) Their vet, who also is a believer of the benefits of coconut oil, was happy to see healthy weight, no worms, no fleas, no skin irritation…. just happy healthy active puppies. I have to say that when I purchased my first tub of coconut oil, I thought it was a little pricey, but that $10 is worth every penny, every time I replenish my supply!!!!! we just started my 10 month old yorkie puppy on coconut for her dry skin hope it works. Hi Laura. I had stopped feeding a fish based diet a few years ago and now I am back to it with Sherman. There was no specific reason for stopping just to change up the proteins a bit. I started a coconut oil routine with my boys (13 year old sheltie mix and I have no idea) a couple of weeks ago. Both were itching and scratching like crazy. The scratching is less but now they are turning their noses up at the oil. I changed brands. Maybe that’s the problem.